The drylands region shared by the United States and Mexico currently faces multiple sustainability challenges at the intersection of the human and natural systems. Warming and drying conditions threaten surface water and groundwater availability, disrupt land- and marine-based livelihood systems, and challenge the sustainability of human settlements. These biophysical challenges are exacerbated by a highly mobile and dynamic population, volatile economic and policy conditions, increased exposure to extreme events, and urbanization on marginal, vulnerable lands. The U.S. National Academies of Sciences, Engineering, and Medicine collaborated with the Mexican Academy of Sciences, Academy of Engineering, and the National Academy of Medicine to plan a 2-day binational workshop, Advancing Sustainability of U.S.-Mexico Transboundary Drylands. The workshop goals were to highlight the challenges facing the region, assess the scientific and technical capacity that each nation can bring to bear in addressing these challenges, and identify new opportunities for binational research collaboration and coordinated management approaches in the advancement of sustainability science and development. This publication summarizes the presentations and discussions from the workshop. The widespread destruction of California, Houston, Puerto Rico, and the Virgin Islands from extreme events, along with continued future transition planning exercises for building and rebuilding, have increased the focus on the potential role of sustainable energy deployment. 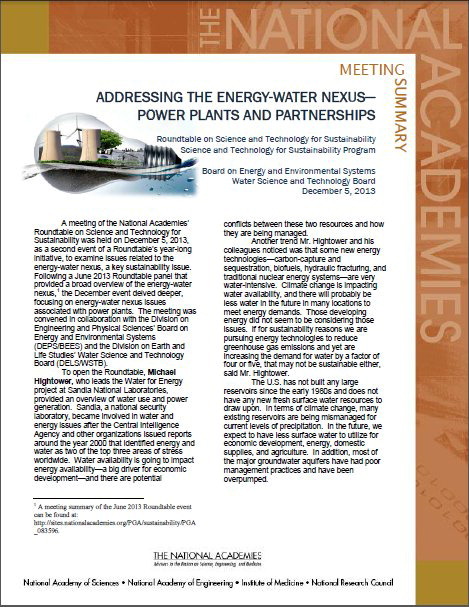 To discuss the opportunities and challenges in deploying sustainable energy during transitions, the National Academies of Sciences, Engineering, and Medicine convened a workshop in Washington, DC, on January 30, 2018. Participants explored how cities, regions, and nations are building renewable energy into their longer-term planning, in accordance with the context of the United Nations’ (UN’s) Sustainable Development Goals (SDGs). This publication summarizes the presentations and discussions from the workshop. To explore the environmental, economic, and social impacts of solar, wind, and energy storage systems, the National Academies of Sciences, Engineering, and Medicine’s Roundtable on Science and Technology for Sustainability held a workshop on June 12, 2017. 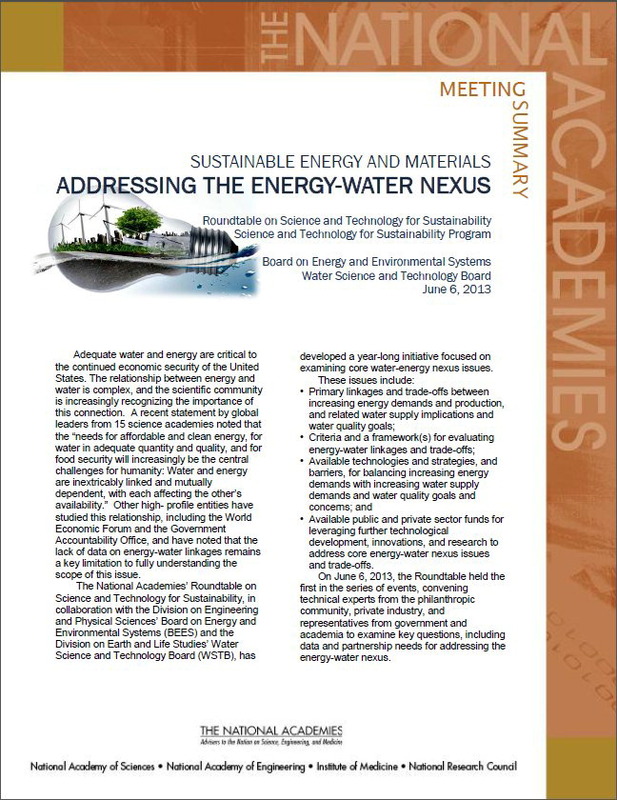 The goals were examining the sustainability implications of material demands and manufacturing processes associated with renewable energy technologies; mobilizing, encouraging, and catalyzing the use of scientific knowledge; and stimulating additional research. This publication briefly summarizes the presentations and discussions from the workshop. An expert committee under the STS Program completed a report that offers a road map and recommendations to help U.S. cities work toward sustainability. The report draws upon lessons learned from nine cities’ efforts to improve sustainability. It recommends that every U.S. city develop a sustainability plan that not only accounts for its own unique characteristics but also adapts strategies that have led to measurable improvements in other cities with similar economic, environmental, and social contexts. A special dissemination event was held on October 24th at the U.S. Environmental Protection Agency (EPA). Read a recent blog post by EPA. 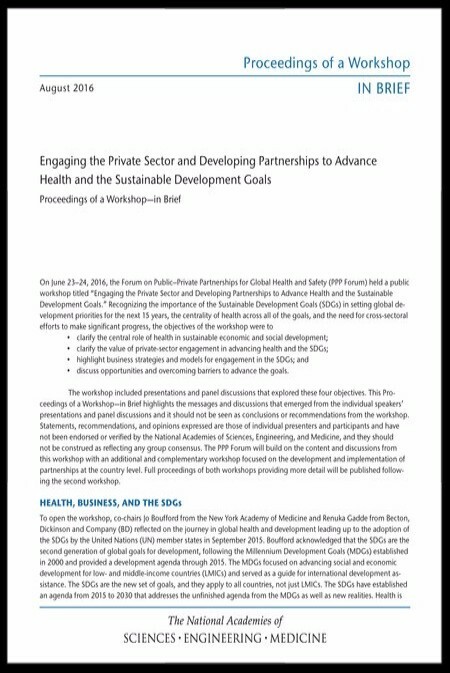 In June 2016, the Academies held a public workshop titled "Engaging the Private Sector and Developing Partnerships to Advance Health and the Sustainable Development Goals". Recognizing the importance of the Sustainable Development Goals (SDGs) in setting global development priorities for the next 15 years, the centrality of health across all of the goals, and the need for cross-sectoral efforts to make significant progress, the objectives of the workshop were to: (1) clarify the central role of health in sustainable economic and social development, (2) clarify the value of private-sector engagement in advancing health and the SDGs, (3) highlight business strategies and models for engagement in the SDGs, and (4) discuss opportunities and overcoming barriers to advance the goals. This publication summarizes and highlights messages that emerged from the individual speakers’ presentations and panel discussions. The past 15 years have brought significant advances in observational and predictive capabilities for a range of natural and social systems, as well as development of other tools and approaches useful for sustainability planning. A careful consideration of how these other approaches might intersect with sustainability is warranted. To further the discussion on these outstanding issues, the STS Program, in collaboration with the Board on Atmospheric Sciences and Climate convened a workshop on January 14–15, 2016. 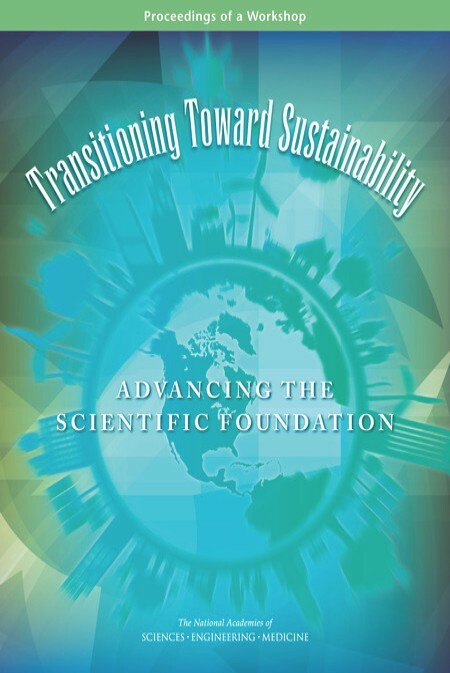 Participants discussed progress in sustainability science during the last 15 years, potential opportunities for advancing the research and use of scientific knowledge to support a transition toward sustainability, and challenges specifically related to establishing indicators and observations to support sustainability research and practice. 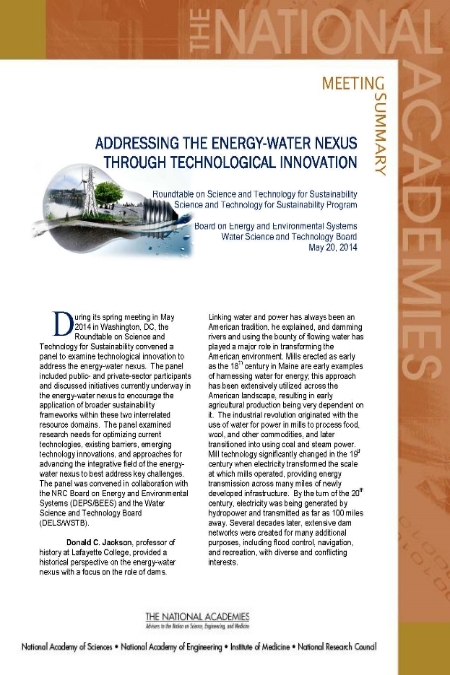 This publication summarizes the presentations and discussions from the workshop. The responsible management of natural resources for present-day needs and future generations requires integrated approaches that are place-based, embrace systems thinking, and incorporate the social, economic, and environmental considerations of sustainability. In June 2015, the STS Program convened a workshop on using landscape-based approaches and mutli-resource analysis to better inform federal decision making for the sustainable management of natural resources. 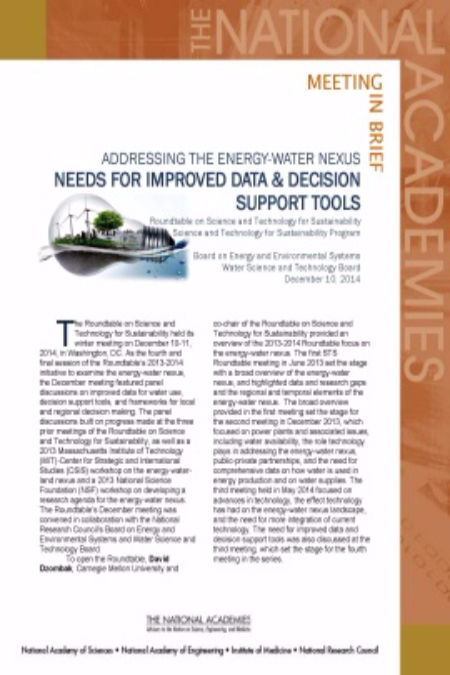 This report summarizes the presentations and discussions from the workshop. This report recommends steps that the Department of State should embrace to take full advantage of the leading science and technology (S&T) capabilities of the United States. These capabilities provide the department with many opportunities to promote a variety of the interests of the United States and its allies in a rapidly changing world wherein S&T are important drivers of economic development at home and abroad and help ensure international security. The report assesses and makes recommendations concerning the changing environment for the conduct of diplomacy in the years ahead, with a focus on the role of S&T in the development and implementation of U.S. policies and programs. An expert committee under the STS Program, in collaboration with the Board on Agriculture and Natural Resources (BANR), completed a report that identifies research priorities to sustainably meet expected increase in global demand for animal protein. The report assesses the global demand for products of animal origin in 2050 within the framework of ensuring global food security; evaluates how climate change and natural resource constraints may impact the ability to meet future global demand for animal products in sustainable production systems; and identifies factors that may impact the ability of the United States to meet demand for animal products, including the need for trained human capital, product safety and quality, and effective communication and adoption of new knowledge, information, and technologies. 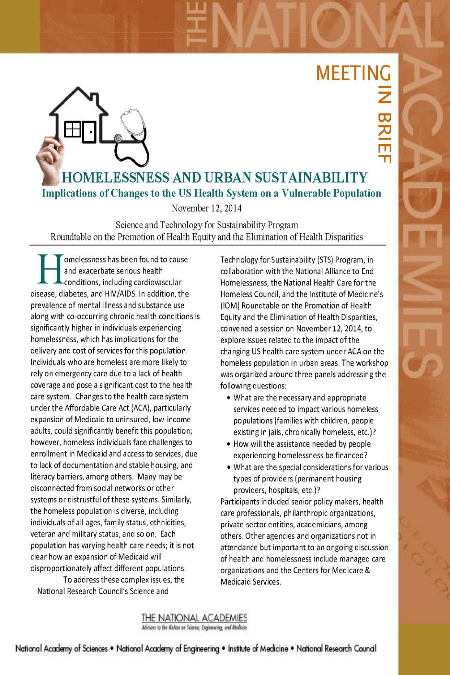 The STS Program, in collaboration with the National Alliance to End Homelessness, the National Health Care for the Homeless Council, and the Institute of Medicine’s (IOM) Roundtable on the Promotion of Health Equity and the Elimination of Health Disparities, convened a session on November 12, 2014, to explore issues related to the impact of the changing US health care system under ACA on the homeless population in urban areas. This meeting in brief synthesizes the discussions held during the event. 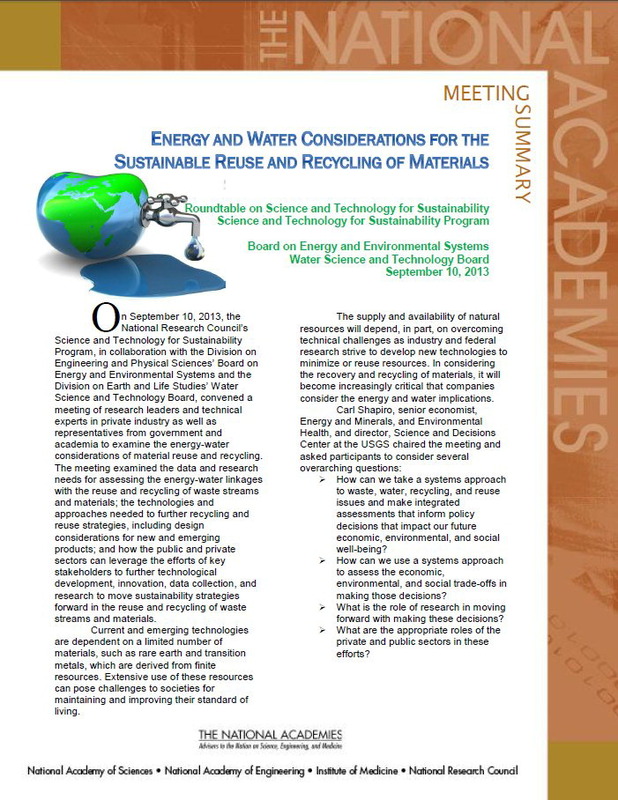 The Board on Environmental Studies and Toxicology (BEST), in collaboration with the STS Program, released a consensus report that examines scientific tools and approaches for incorporating sustainability concepts into assessments used to support the U.S. Environmental Protection Agency’s (EPA’s) decision making. 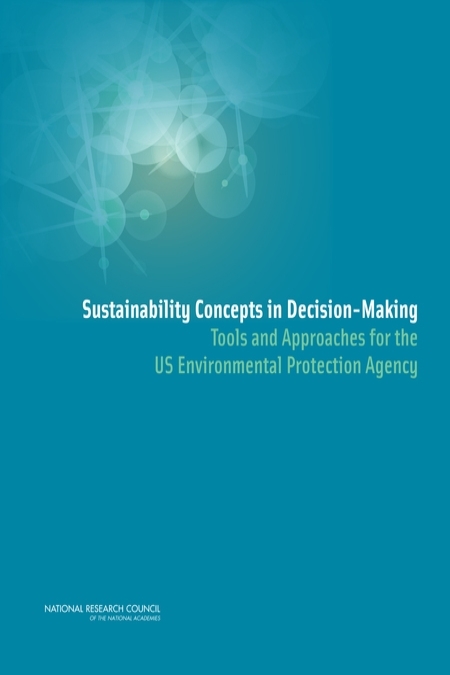 Using specific case studies, this report considers the application of analytic and scientific tools, methods, and approaches presented in the 2011 NRC report Sustainability and the U.S. EPA. The report examines both currently available and emerging tools, methods, and approaches to find those most appropriate for assessing and/or evaluating potential economic, social and environmental outcomes within an EPA decision context. 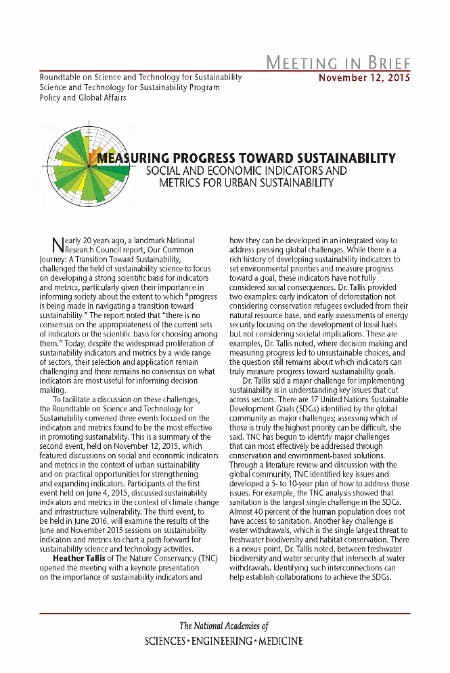 The report also discusses data needs and post-decision evaluation of outcomes on dimensions of sustainability. An ad hoc committee of the Division on Earth & Life Studies’ Nuclear and Radiation Studies Board (DELS/NRSB), in collaboration with the STS program, organized two public workshops in October 2013 and January 2014 on best practices for risk-informed remedy selection, closure, and post-closure control of radioactive and chemically contaminated sites that present significant difficulty for remediation to unrestricted release. 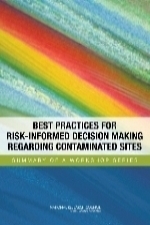 The workshop series aimed to explore best practices that promote effective, risk-informed decision making and future opportunities to improve remediation approaches and practices. This report is the summary of two workshops. The Earth's population, currently 7.2 billion, is expected to continue to rise over the next 40 years. Current projections are that the Earth will likely need to support 9.6 billion people by the year 2050, a figure that climbs to nearly 11 billion by the year 2100. 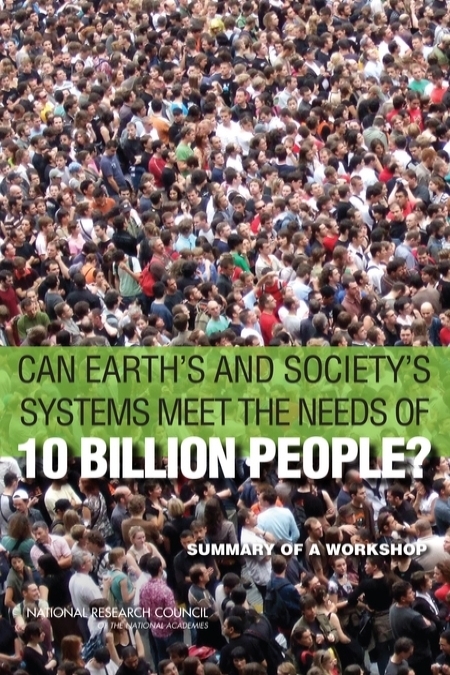 This report is the summary of a multi-disciplinary workshop convened by the National Academies in October 2013 to explore how to accommodate a world population of 10 billion in a sustainable way while simultaneously increasing the well-being and standard of living for that population. This report examines key issues in the science of sustainability that are related to overall human population size, population growth, aging populations, migration toward cities, differential consumption, and land use change, by different subpopulations, as viewed through the lenses of both social and natural science. In May 2013, a committee under the STS Program convened a workshop to examine issues relating to sustainability and human-environment interactions in the Portland metropolitan region. Topics addressed included the role of land-use restrictions on development, transportation innovations, and economic and social challenges. The speakers at the workshop used examples from Portland and the greater Pacific Northwest region to explore critical questions in finding pathways to urban sustainability. Liquid fuels are a major part of modern life. They supply energy for ground, water, and air transportation as well as power for industrial and farming machinery. However, the use of fossil fuels has obvious health downsides, such as emissions of pollutants that are directly harmful to health. In the face of these concerns, new policies have been created that encourage the development of renewable sources of energy in general and biofuels in particular. In January 2013, the Roundtable on Environmental Health Sciences, Research, and Medicine of the Institute of Medicine held a workshop on the intersection of biofuels, climate change, and human health. 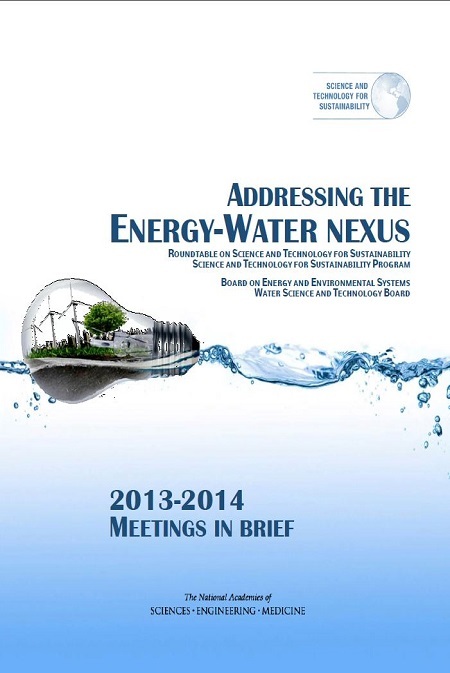 This report summarizes the workshop proceedings. A new National Research Council report provides a decision framework which can be used by policymakers to examine the consequences, tradeoffs, synergies, and operational benefits of sustainability-oriented programs. The committee identifies linkages among areas such as energy, water, land, and nonrenewable resources that are critical to promoting and encouraging long term sustainability within the federal policy framework, recognizing that progress towards sustainability involves many institutions. 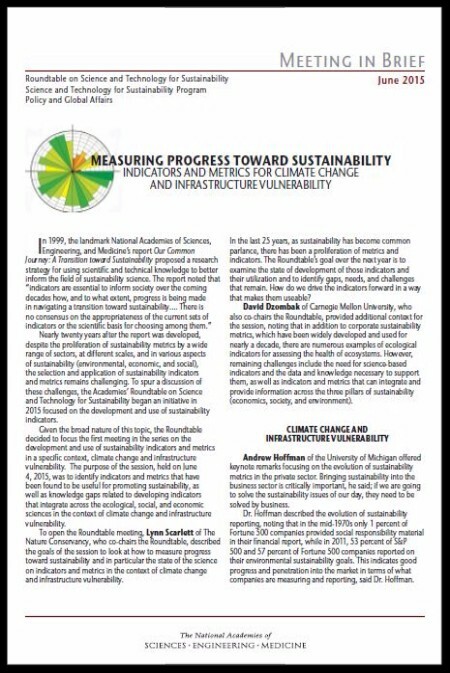 The report also recommends priority areas for interagency cooperation on specific sustainability challenges; identifies impediments to interdisciplinary, cross-media federal programs; and highlights scientific research gaps as they relate to these interdisciplinary, cross-media approaches to sustainability. A booklet provides a short summary of the report. 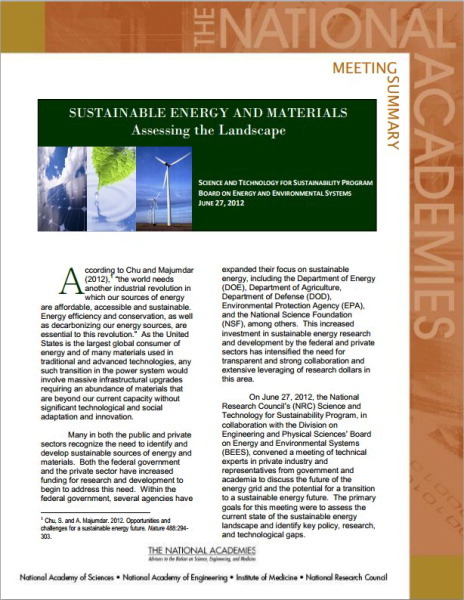 The National Academies organized a public workshop to examine issues relating to sustainability and human-environment interactions in the Houston metropolitan region held in January 2012. Topics addressed included energy and air quality management, hazard mitigation, and land use considerations. The committee developed an agenda in consultation with regional stakeholders (academia, city/county governments), so that the presentations and panels reflect place-based knowledge and approaches to sustainability. The workshop featured invited presentations and group discussion, and was patterned after similar workshops held in 2009 on research and development on urban systems and in 2010 on urban sustainability in the Atlanta metropolitan region. 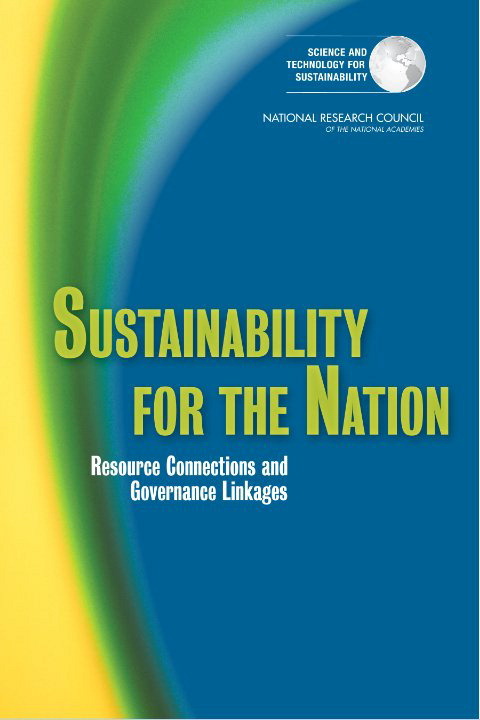 This report recaps a December 2011 workshop convened on behalf of the General Services Administration on how better to foster sustainability considerations into procurement tools and capabilities across the public and private sectors. It summarizes presentations and discussions that assessed the current landscape of green purchasing tools, identified opportunities and emerging requirements for enhanced and/or new tools, identified potential barriers to progress (such as cross-tool interoperability), and explored potential solutions. This summary also recaps discussions at the workshop on associated training required to realize the full benefits of these tools. The Science and Technology for Sustainability Program hosted two workshops in 2011 addressing the sustainability challenges associated with food security for all. The first workshop, Measuring Food Insecurity and Assessing the Sustainability of Global Food Systems, explored the availability and quality of commonly used indicators for food security and malnutrition; poverty; and natural resources and agricultural productivity. The second workshop, Exploring Sustainable Solutions for Increasing Global Food Supplies , focused specifically on assuring the availability of adequate food supplies. Workshop objectives included identifying the major challenges and opportunities associated with achieving sustainable food security and identifying needed policy, science, and governance interventions. This is a report of two workshops. The National Research Council's Science and Technology for Sustainability (STS) Program recently released the final summary report Pathways to Urban Sustainability: The Atlanta Metropolitan Region. The report summarizes discussions from a September 2010 workshop which focused on the Atlanta metropolitan region's approach to urban sustainability, including how the interaction of various systems (natural and human systems; energy, water, transportation systems) affect the region's social, economic, and environmental conditions. The report also summarized discussions of the challenges the region faces, innovate approaches being implemented to address these complex challenges, performance measures being used to gauge success, and potential opportunities to link knowledge with on-the-ground action.